I am so drawn to this scrappy pattern! 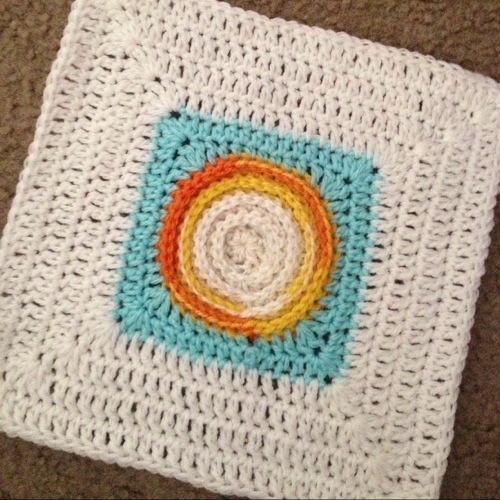 I used ICE YARNS “Dancing Baby” for the wheel center and Bernat Softee Baby for the squaring off and the white background. This pattern will be a first for me because I am going to CROCHET THE FINISHED MOTIFS TOGETHER!! Sorry, I had to yell it because I almost exclusively join as I go… So, I’ll be SC-ing or Slst-ing them together. Haven’t decided which! Bear’s Rainbow Blanket in IG-Land! aemeabe has finished her gorgeous blanket – loving the grey and the border.